Simplifying client technology is the surest way to add value to their infrastructure while empowering them to innovate their core business. RYCOM HIVE makes the complex simple. The effectiveness of HIVE lies in our unique approach and experience, our domain experts, our innovative platforms and technologies, and the carefully chosen partners we work with. 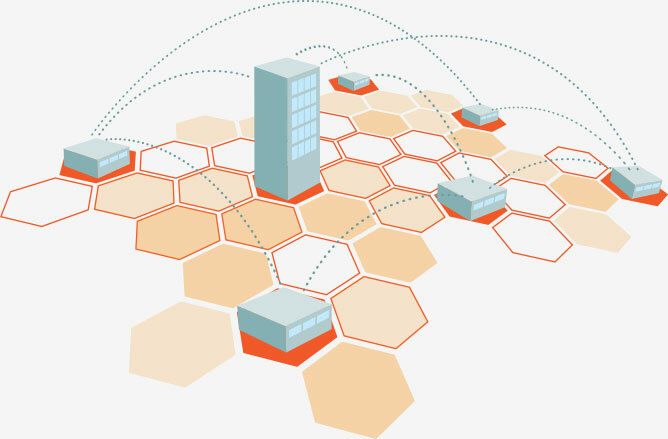 HIVE is what makes SMART buildings, campuses and communities SMART. Industrious. Cooperative. Smart. Everything you’d want in a business partner. HIVE is the result of 20 years of tested, industry-leading innovation. It brings together an integrated suite of solutions and services designed to add value to a company by understanding the role technology can play in maximizing operational efficiencies and productivity. HIVE does this by creating unified platforms and networks, frameworks for compatibility and integration, and the ability to harness purposeful data so your business decisions are always based on the latest information. By nature, HIVE is made stronger by each cell in the structure and when multiple systems and deep skillsets are working together as one. HIVE partners work much the same way by bringing leading-edge, game-changing capabilities to the table. Never at rest, HIVE is constantly capturing, measuring, and analyzing KPIs and data to facilitate proactive management, to find problems before they happen, and to create Systems at work. We don’t influence your technology infrastructure, you do. We understand that every business has a unique set of technology requirements. It’s why we begin with the business drivers that influence them. Projects can range from the simple to the complex, but one thing you can count on is that they’re constantly changing. HIVE ensures your business has the flexibility to be on target not only for today but tomorrow as well. This adaptable nimbleness means we can seamlessly integrate ourselves into any project at any stage, using any or all of our tools – Strategize, Design, Deploy and Optimize – depending on what is needed. Behind every successful enterprise is a team of innovative, creative and passionate people who are invested in the success of your company as much as you are. The future is arriving faster than ever. Our strategies are built to address immediate needs while always focusing on the long-term business objectives of our clients. 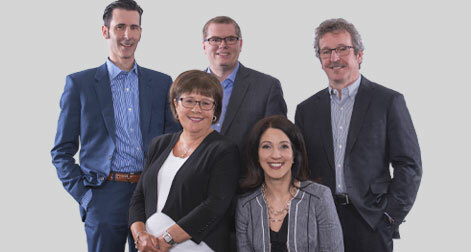 In-depth information gathering and client collaboration help us to build strategies that add value by reducing costs and redundancies, uncovering potential revenue opportunities, enhancing client relationships, and mitigating risk and liability. I’M MORE THAN AN ADVANCED PROBLEM SOLVER. I’M YOUR SYSTEM STRATEGIST. We’re invested in your business success, so we don’t take the responsibility of finding the right technology solution lightly. By listening, we tailor a strategy that builds on what is already working and make recommendations for what’s not. An effective design, no matter how big or small, must have the ability to scale. We approach design in a way that ensures it can be engineered to expand with the growing needs of today’s businesses. 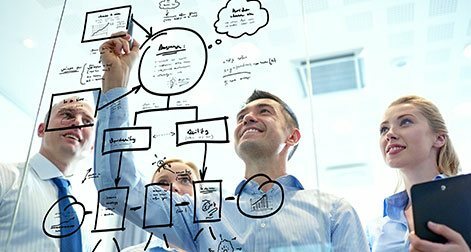 We take information obtained through systems audits and a comprehensive requirements-gathering process, and use it as the foundation for building a master blueprint to map the best possible services and solutions for today and into the future – to achieve your business goals. WE WON’T INFLUENCE YOUR MASTER ‘SMART’ BLUEPRINT. YOU WILL. We take information obtained through systems audits and comprehensive requirements gathering to map the best possible service or solution to meet your needs today and into the future. We’ve become industry leaders by understanding and operating within the entire technology ecosystem. We build networks from the ground up or integrate into existing systems with solutions – leveraging and working within the latest cloud and IoT platforms. From the integration of control and mechanical systems, networks and IT, to development and visualization, we do what it takes and we do it well. WE HAVE A VALUABLE TOOL TO HELP YOUR BUSINESS SUCCEED. WE CALL IT EXPERIENCE. We believe technology should be invisible, but support the critical systems of your infrastructure. We are Master Integrators who combine your capabilities with ours. Optimization means that there is no finish line – only the ongoing evolution and enhancement of your technologies, building processes, productivity and client experiences. Beyond harnessing your building data and creating actionable results, HIVE solutions are always working to enhance business outcomes, exceed expectations and tackle problems before they occur. KPIs AND ANALYTICS MAKE GOOD BUSINESS PARTNERS. We turn information into the insights that mobilize your organization and prioritize your business objectives through big data and analytics - giving you the power to innovate, lead and drive business success. We live in a world where every building is capable of being SMART. It doesn’t matter if the building is big or small, the most basic or complex systems are continuously generating data that will go unused unless properly harnessed and analyzed. A SMART building does just that. SMART leverages the data generated by your building systems, such as BAS, lighting, elevators, parking systems, etc., and provides you with system information that can be analyzed for actionable insights. HIVE SMART Platform takes this to the next step. We don’t just drop the data off at your door and ask you to come up with business insights – we provide you with a platform that takes data from all your interacting building systems and provides easy-to-understand, actionable insights. HIVE SMART Platform allows you to make more informed decisions about your business, find efficiencies, enhance your tenant experience and run things differently than you have before – because now you can. Click here to learn more about how HIVE SMART Platform can empower your future business decisions. When two or more passionate and industry-leading entities unite with a common purpose, their power to innovate is far greater than the sum of the parts. Systems work stronger when they’re together. By nature, a hive is made stronger by each cell in the structure. HIVE partners work in much the same way. We bring together the best and the brightest in the industry, combining our strengths with theirs to increase innovation exponentially. Our carefully chosen partners bring unique strengths to the table and are integral building blocks for the HIVE suite of solutions and services. Together, we make your systems stronger by combining forces and by investing ourselves in the success of your enterprise. BUENO is the Australian leader in data-driven operational property services. They deliver superior data-related and technology-driven services based on fault detection, optimization and business intelligence. BUENO provides the data harvesting, analytics and integration engine for parts of the HIVE SMART Platform that simplify our clients’ operations and enhance their effectiveness across all building information systems, including building automation, fire, security, car park and elevator systems. As technology pushes for convergence of sub-systems, building managers seek greater control in management and monitoring. Cisco provides converging IP networks technology to connect and reach for building, campus, tenant and community systems through cloud and IoT. An ecosystem of various industry partners, including building vendors, consultants and telecom providers who provide sensors and supporting platforms to enable workflow solutions designed by HIVE SMART Master Integrators. 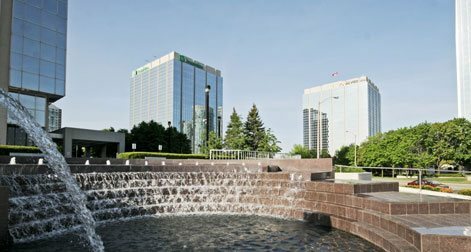 Managed by Colliers International, the Mississauga Executive Centre (MEC) office campus is home to major tenants like Desjardins General Insurance, D+H, Symcor, Element Financial and RBC Dominion Securities. With 20 years of tested, industry-leading innovation and experience, our Integrated HIVE Services are made up of telecom, technology, infrastructure, data and managed/unmanaged support services.